It does not get any simpler than this. 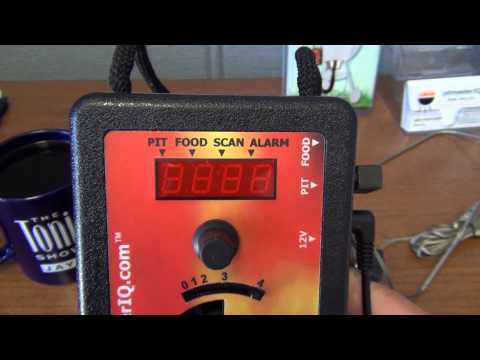 The PitmasterIQ IQ120 is an automatic BBQ controller for charcoal grilling. It is a self-contained, easy-to-use device used to regulate internal grill temperature and feed air to the charcoal fire as necessary to maintain the desired cooking temperature. It connects to almost any charcoal or wood-fueled kamado grill easily, with no required tools. Enjoy a digital display that shows the exact cooking and food temperatures. The digital encoder knob rotates to set a desired cooking temperature. This unit also gives you the ability to set other parameters, including alarms that indicate when the food is done and programmable cooking temperature changes. A temperature probe is clipped to your cooking grate to monitor the internal temperature of your grill. Another probe is included to provide the temperature of your food. The 5-15 CFM variable speed blower automatically adjusts air flow to sustain the selected setting. Temperatures between 150-400 degrees are easily maintained for long periods of time. The temperature cable is 72 inches long. Includes IQ120 blower box, air tube, AC power supply, two probes for grill and food, users guide, and large kamado adapter kit. Fits Weber, Char-Broil, Brinkman, Viking and any Kamado with sliding lower vent door height of 2 3/4 to 3 3/4 inches.